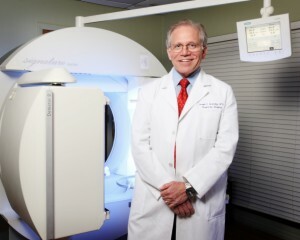 Nuclear medicine, or scan, uses a small amount of a radioactive substance to produce two or three dimensional images of body anatomy and function. The diagnostic images produced by a nuclear scan are used to evaluate a variety of diseases. Sometimes a nuclear scan is combined with a CT scan. What are some common uses of Nuclear Medicine? Usually, no special preparation is needed. However, if the exam is done to evaluate the stomach, you may be asked to refrain from eating immediately before the test. If the exam is done to evaluate the kidneys, you may need to drink plenty of water before the test. Although imaging time can vary, the exam generally takes 20 to 45 minutes. A radiopharmaceutical, known as a tracer, is usually administered either intravenously or by mouth. What radiopharmaceutical is used and when the imaging will be done – immediately, a few hours later, or even several days after the injection, is dependent upon the type of exam you’re having. For most nuclear scans, you will lie down on a table and a nuclear imaging camera will be used to capture the image of the area being examined. The camera is either suspended over or below the exam table or in a large donut-shaped machine similar to a CT scanner. While the images are being obtained, you must remain as still as possible. Most of the radioactivity is expelled out of your body in urine or stool. The rest simply disappears through over time. Although usually done with a small needle, some patients experience some minor discomfort from the intravenous injection, or IV. Also, lying still on the examining table may be uncomfortable for some patients. You will hear low-level clicking or buzzing noises from the machine.